I am a bit behind to say the least on recapping the trip to Lompoc with the girls! Back in early July we decided we needed a new wine adventure. Emily and Karen live in Santa Barbara so the Urban Wine Trail and neighboring Santa Ynez wineries are frequently visited on my trips to the area. As my knowledge of California wine regions grows – so does my desire to taste there! Lompoc is located about an hour North of Santa Barbara and features the great wines of the Santa Rita Hills AVA. The ocean breeze of this cooler climate region is excellent for Chardonnay, Pinot Noir and other cool region grapes. 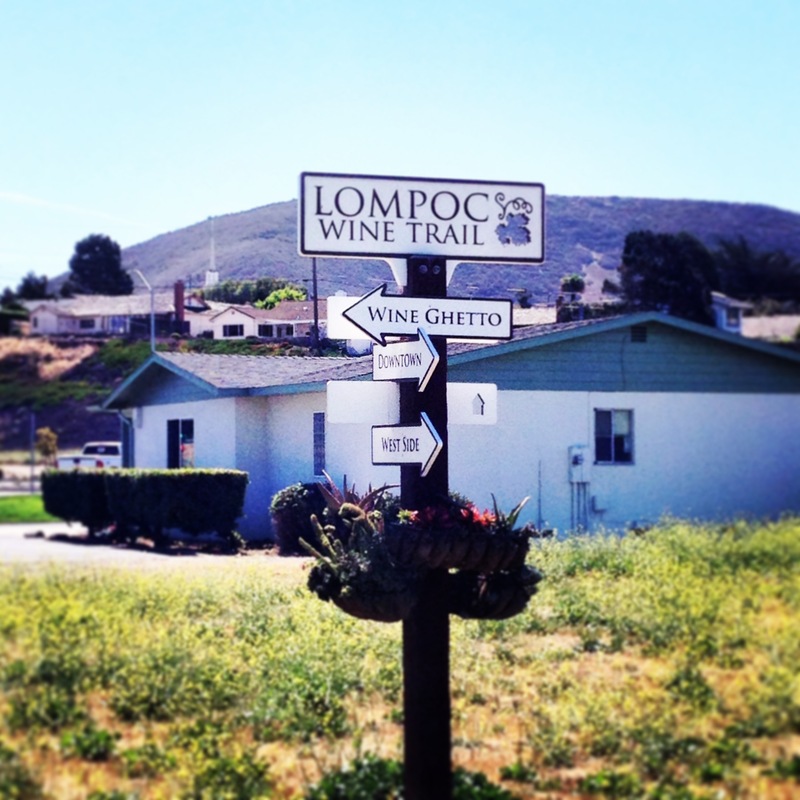 Traveling to Lompoc to taste is VERY different from a traditional winery experience, the tasting rooms are literally referred to as the “Lompoc Wine Ghetto.” There are no rolling hills with vineyards for miles, rather an industrial complex behind a Home Depot that is not permitted to sell food! For the most part the wines made up for the lack of ambiance. We drove up from SB on Saturday AM and drove directly to our FANCY hotel the O’Cairns Inn. It was basic but everyone was super nice and it was about a 10 minute walk to the tasting rooms. We love to taste and understand the importance of not driving under the influence. Walking to the tastings allowed all three of us to enjoy the day. We packed up our lunch and headed to the tasting rooms. We did have a bit of a walk on the wild side as we adventured on a trail through a vacant lot to reach our tasting destination. All arrived safe free of snake bites and bee stings. Each of us has put together a list of wineries we wanted to taste at – there are 20 tasting rooms in the primary area alone! We were surprised that all the tasting rooms seemed to have similar hours of 11-5. If one or two more were to open at 10 or stay open until 6 – man would their tasting rooms be hopping. Our original plan was to start at Flying Goat but at 11 am they didn’t seem to be open and Fiddlehead Cellars already had their sign out. So we started at Fiddlehead and we were so glad! I noticed there were several pins around tasting table – one was “Think Pink.” My love for rose is something that I am very vocal about. Immediately the host changed our tasting to start with the rose. The Dry Rose of Pinot Noir was good, but ultimately not my favorite from them or in Lompoc. They do the tasting starting with the red wines. It was no sooner than Karen’s first sip of the 10th Anniversary – she was in love. Between the three of us we do have several wine memberships but we have never seen someone eager to join after one taste! I throughly enjoyed the Pinot Noir – the black cherry palate with a nose of black pepper were only matched by the silky tannins on the tongue. We also tried the 728 Pinot Noir, 2 Sauvginon Blanc as well as their “Sweetie.” All were enjoyable but by far the 10th Anniversary was my favorite – I added this bottle to my collection. Karen added a few others as she picked up her first shipment that day! Karen and Emily used the 728 Pinot Noir to participate in the 728 day photo contest. Emily loving the soil samples! By the time we were finished at Fiddlehead we walked over (about a minute in the parking lot) to Flying Goat. In all the research everyone RAVED about Flying Goat. They offered two separate tasting menus- one sparkling and one still. We split both. Overall we were not impressed, it could have been the wine or the way the owner was talking down to the new hire in the tasting room. 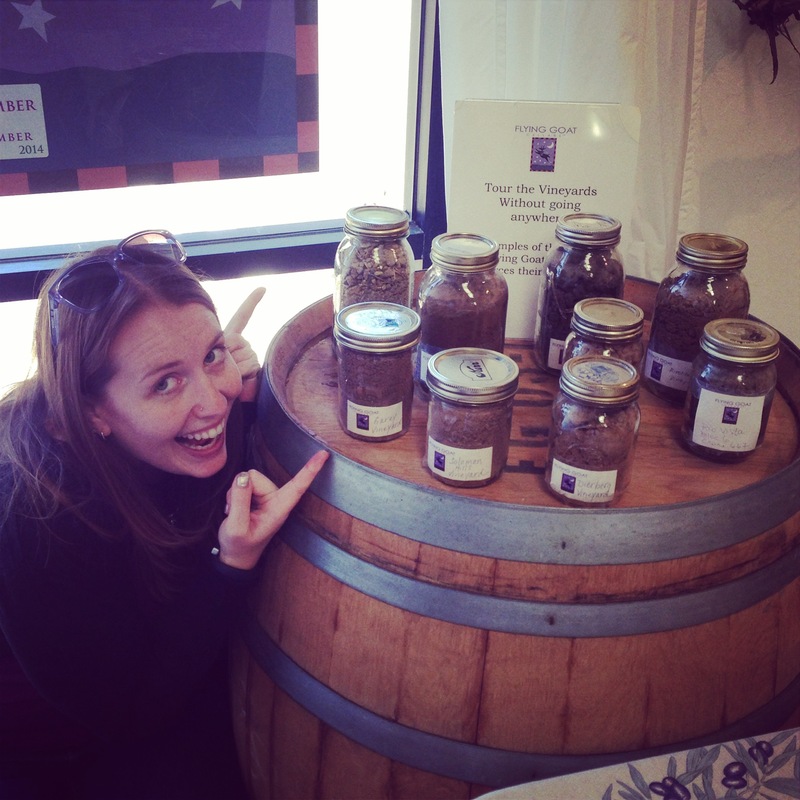 Emily in the photo with the soil samples was the happiest the three of us were at any point in the tasting room. My opinion – pass and never look back. 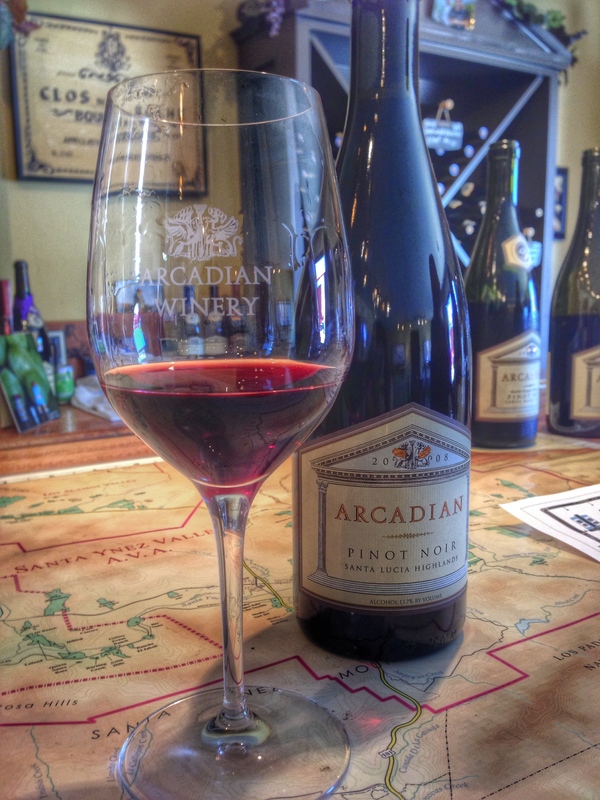 As we decided on our next winery – I put my foot down and said I wanted to go to Arcadian. I had read some reviews and heard their wines were really good. It didn’t hurt that there was two wine barrel recliners in the front that Emily and Karen immediately ran to since they were tired from standing at the first two rooms. The Arcadian Winery tasting room also features the Bratcher wines. The room was larger with a L-shaped bar for tasting and the two ladies in the tasting room were more than friendly! There were six wines on the tasting menu – 3 from each winery. It was clear immediately that the wines has been held until they were ready to be consumed – the youngest wine was a 2009. While standing at the bar chatting with my friends and the hosts – I noticed that they had various wines from the Santa Lucia Highlands and even more specifically from the “Gary’s Vineyard.” This particular block and region is one of my favorites – as I normally do I asked nicely if anything else was open from that region. They had one open – it was very enjoyable, I won’t lie! They may or may not have opened a few other for us to enjoy. All the wines were great, it was being to become clear that I may have found my new winery to belong to. (Note- I also belong at Copain Wines in Healdsburg) The tasting room also had a large table – we were socializing and enjoying all the additional pour but really needed to eat. We knew there was a place that sold fresh bread – when we asked one of the ladies about it – she offered to go and got one with her discount. We ate our cheese, hummus and additional snacks with the fresh-baked bread. We can’t forget the cold filtered water! Karen and I were both into the Syrah (cherry cola and blackberry on the tongue with rich floral and spicy nose)- at a $30 price point before my new membership discount you can’t go wrong! At the suggestion of the ladies, we moved next store to La Montagne another local winery. The tasting room was staffed by Kim the winemaker. Overall the wines were okay – a lot of the items were either sold out or available only to members. I understand why wineries have limited releases but at the same time after allocation is done, it only makes sense to try to sell more wine and gain awareness. I clearly was pre-occupied, I forgot to take a photo. Our day had gone high-low-high-low and we were wondering what wines to try next. 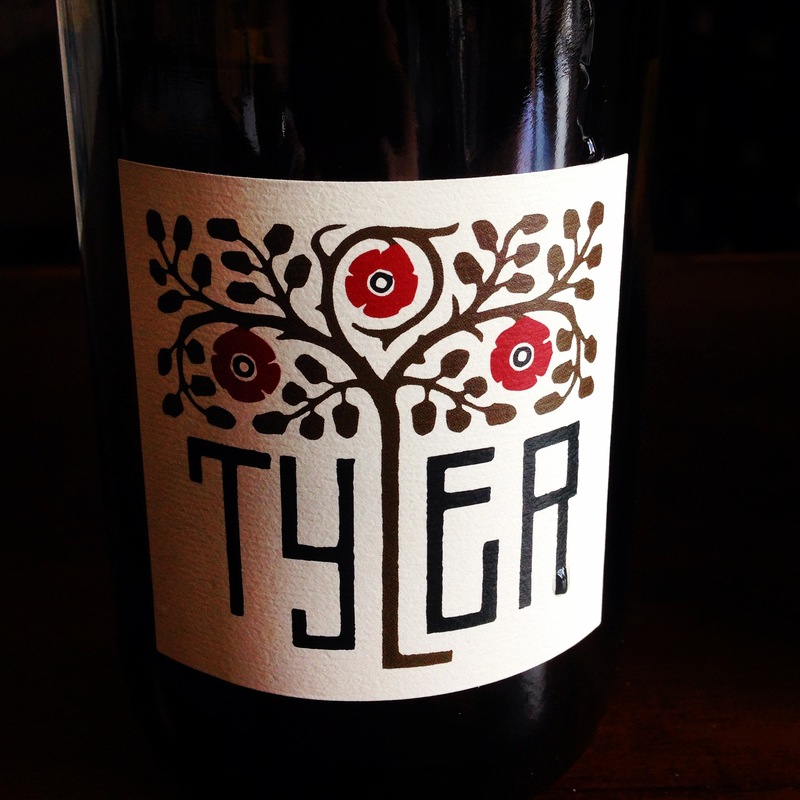 We looked back at our list, and decided we had a lot of Pinot Noirs. 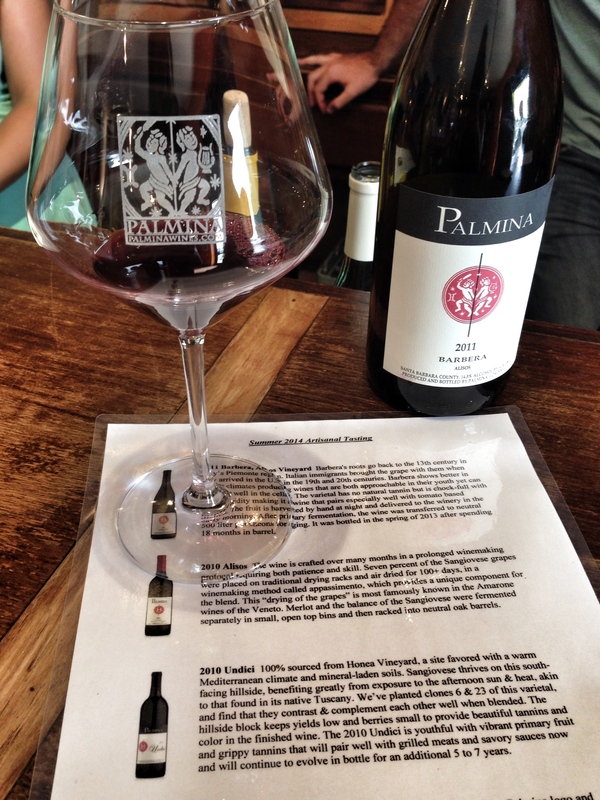 We knew Palmina focused on more of the Italian varietals and were ready to make the change. I have waited so long to post about this trip one of the Palmina wines was featured on the Today Show for a best buy under $20 for fall! We decide to proceed with one tasting split 3 ways as by winery number 5- we had a lot of wine! At all the other wineries we had split tastings – normally 2 tastings for the 3 of us. 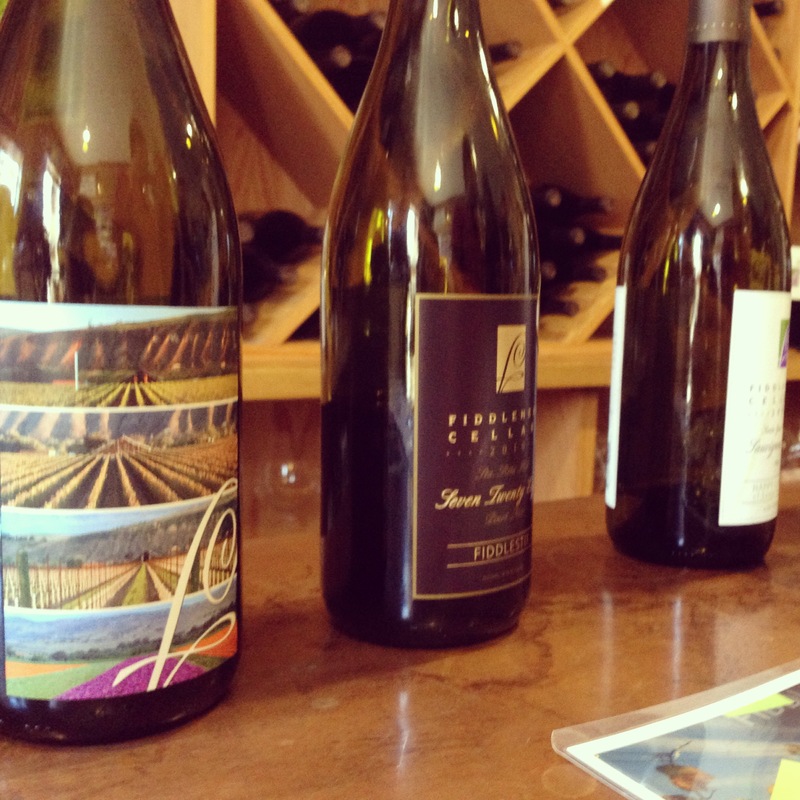 We opted for Artisan tasting – we definitely enjoyed all the wines. I also had a taste of their rose – which I really did enjoy! I found out they had the rose on tap, and it was less than a traditional bottle. During the summer I can easily go through a bottle of rose a week so I was sold!This is one of the things I really enjoy – Pali (who has a tasting room in Lompoc and SB) regularly has great wines on tap. Most people would likely have looked at our successes and called it a day. We are NOT those people. We knew the next day we would only have time for one or two places as someone (Karen) wanted to make it home for the second half of the World Cup Final game. We left the main grouping of wineries and headed to Tyler which is wine that Karen had tried previously. The logo was beautiful but the tasting are was a small bar with 4 bar stools open to the barrel room. Our sweaters definitely came in handy! The wine here has a lot of potential to be good, but all we were able to taste was 2012 reds. It wasn’t clear if the wines would be able to age to the level of the other pinot noirs we loved as the palate didn’t see to have the same complexity. I would be willing to try an older wine before making a final judgement but overall need more time. Emily and I had a similar experience in Healdsburg with a really well know and high regarded winery. They had sold out of all the older stuff and were serving wines nowhere near ready to be sampled. As we leave Tyler – we decided we had to walk through the main ghetto to get back to our hotel. It was a few minutes after 5pm and most places were already closed. We noticed that the open light was still on at Taste of Santa Rita Hills and figured we may as well go in! Antonio Moretti was more than willing to help our party of three. For the first time in the day we each got our own – it was time to sample a few from different places. 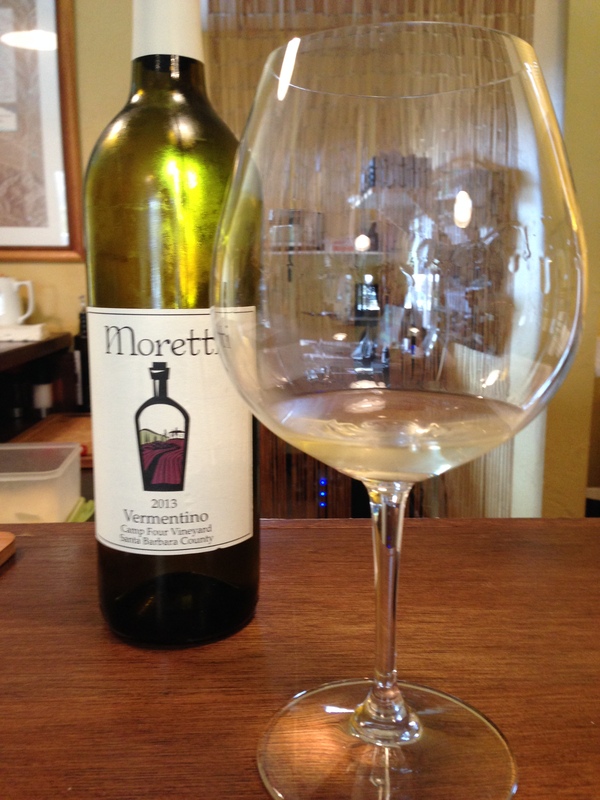 We learned that the tasting room was opened before he had enough of his own wine to have a full-fledged tasting room (located several doors down) for Moretti Wines. The tasting list included 1 white and 4 different pinots. He instructed us on a few to pair with a cheese or cracker that he provided. I asked about the rose or anything special and we did get a few more pours. It worked out well for him – all of us purchased at least one bottle! Amazing that we tasted at SEVEN different locations between 11 and 6. We started the trek back to the hotel – amused by the local sites — a bail bondman trailer, some fake deer and people watching. Stay tuned for the dinner and day 2 recap as well as some tips for surviving the ghetto. Posted in Wine TastingsTagged chardonnay, girlsweekend, lompoc, Pinot Noir, pinotnoir, Santa Barbara, santaritahills, tasting rooms, tastingroom, Wine with Friends, wineghetto, winetripsBookmark the permalink.